GALLIPOLIS, Ohio — When it comes to the Ohio high school playoffs and Ohio Valley Publishing area football teams, the scenarios are relatively simple. Meigs, River Valley, South Gallia and Eastern will all be making their final gridiron appearance of the 2018 campaign this weekend, but Southern still has a shot to join Gallia Academy in the opening round of the postseason. The Blue Devils (8-1) enter Week 10 having already locked up a home game in the Division IV, Region 15 bracket, and — win or lose with visiting South Point this Friday — the Blue and White will finish no higher than second and no lower than third in the final eight-team bracket. The Tornadoes (6-3), on the other hand, definitely have to win at Eastern on Saturday night to keep any chances alive, but the Purple and Gold also have to do a little scoreboard watching in the Division VII, Region 27 bracket on Friday night. If Caldwell (5-4) — which currently sits eighth in the region — loses at Shenandoah (4-5) on Friday, then SHS will be in control of its own fate headed into Saturday’s game. If Caldwell ends up defeating Shenandoah, then the Tornadoes are more than likely going to be eliminated from playoff contention before Saturday’s kickoff at East Shade River Stadium. South Gallia (3-6) hosts River Valley (0-9) on Saturday night in the first-ever head-to-head gridiron contest between the two programs. Meigs (3-6) also travels to Alexander on Friday to wrap up TVC Ohio play. Outside of the OVP area, there are several other games of importance in regards to the 2018 OHSAA playoff picture. Athens (8-1) — currently seventh in (D-3) Region 11 — travels to Nelsonville-York (4-5) on Friday night for what ends up being the TVC Ohio championship game. The Bulldogs have already clinched a share of the crown, but the Buckeyes — currently 12th in (D-6) Region 23 — are the only team that can split the league title with AHS. Belpre (6-3) — currently 10th in Region 23 — needs a win at playoff-bound Waterford (7-2) on Friday to keep any postseason hopes alive. Ironton (6-3) — currently fifth in (D-5) Region 19— can lock up a postseason berth with a win at Portsmouth on Friday. The host Trojans (6-3) are currently 10th in (D-5) Region 20 and need a victory to stay alive in the playoff chase. Fairland (5-4) — currently seventh in Region 15 — needs a win at Chesapeake (5-4) — currently ninth in Region 19 — on Friday to stay alive, plus losses by Licking Valley (6-3) and Philo (6-3) to assure a spot in the postseason. The Panthers, conversely, need a win, plus losses by Martins Ferry (6-3), Oak Hill (7-2) and Gahanna Columbus Academy (5-4) to make the postseason. The Oaks, however, can lock up a Region 19 berth with a win over visiting Green this weekend. The Bobcats (8-1) currently sit fifth in Region 27 and are also looking to wrap up a postseason appearance with a victory. Two teams in desperate need of a win for any playoff possibilities will happen Friday in Ohio’s First Capital as Chillicothe (7-2) welcomes Jackson (6-3) for the Frontier Athletic Conference finale. The Cavaliers are currently eighth in the (D-2) Region 8 bracket, while the Ironmen (6-3) sit ninth in the Region 11 breakdown. The southeast portion of Ohio has already secured several playoff berths, with Hillsboro (Region 11), Waverly (Region 16), Wheelersburg (Region 20) Paint Valley and Adena (Region 23), and Trimble (Region 27) joining the likes of Gallia Academy and Waterford. 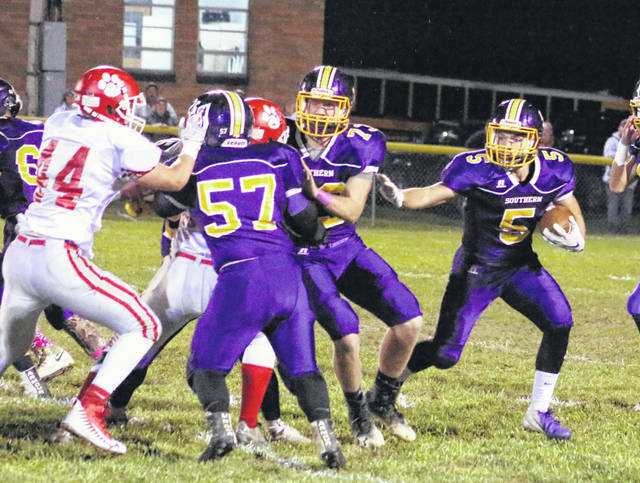 Unioto (6-3), Southeastern (6-3) and Portsmouth West (6-3) also control their own destinies this weekend, with respective wins locking up playoff berths. The Shermans (Region 15) travel to Piketon to face the 1-8 Redstreaks. The Panthers (Region 23) host 4-5 Westfall. The Siders (Region 20) entertain visiting Wheelersburg (8-1). The official pairings for the 2018 OHSAA football playoffs will be released on Sunday, Oct. 28. Divisions I, II, III and VI will start the postseason on Friday, Nov. 2. Division IV, V and VII contests will begin on Saturday, Nov. 3. All Week 11 playoff games kickoff at 7 p.m.